How do I practise writing sentences in Japanese? How do I practise writing Japanese Sentences? (Note: I have no idea how to phrase any of this.) I feel like this is essentially a problem of trying to think in Japanese instead of simply having nothing to write about, since every time I try to write something in Japanese, I can't think of anything to say. I then try to think of something to say in English that I can say in Japanese, but I have trouble there, too, as I still can't think of what to say in Japanese. I think I may have trouble recalling any Japanese word I could use, although I'm not sure. I am not sure I am getting what you meant in your question. As you did not mention how long you have been studying Japanese, I am not sure what is your Japanese competency. Therefore I am going to assume that you have studied Japanese for at least a year and can make basic Japanese sentences. From what you have mentioned: "I then try to think of something to say in English that I can say in Japanese, but I have trouble there, too, as I still can't think of what to say in Japanese. I think I may have trouble recalling any Japanese word I could use", it seems like you have two challenges. 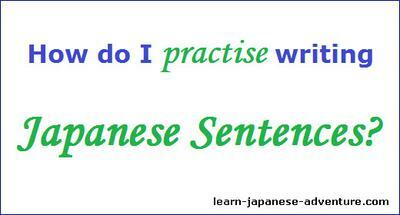 The first challenge might be you are facing difficulties to form a sentence in Japanese. However, if you have studied Japanese for some time (at least a year), you should not have any problem doing that. You might want to refer back to your textbooks or notes (or something similar) where you have studied from the past. the basic Japanese lessons and intermediate Japanese lessons in this website. There are full of examples on how to form Japanese sentences. The second challenge you are facing might be your lacking of Japanese words and vocabulary. It will be very difficult to form sentences if you don't know what are the Japanese words to use in the sentences. For this my suggestion is that you increase your knowledge of Japanese words and vocabulary. Go back and re-study your Japanese vocabulary scripts (if you have any). Get a copy of Japanese english dictionary, or even better get a Japanese electronic dictionary. You might also want to take a look at this page on Japanese words and vocabulary. Overall, I think you have to try writing your first Japanese sentence, even if it's full of mistakes. It's from these mistakes that you'll learn how to form a good Japanese sentence. Try it out! You can always write back again (in the comment section) and someone or myself can check for you. In my opinion, it's not so easy for a non-native speaker to think in Japanese and then write out something in Japanese. You must have already studied the language for quite a number of years and master the language in order to do that. I think those people who has studied or worked in Japan might be able to do that, as you are "forced" to do so because they are surrounded in a Japanese-speaking environment. For people who learned Japanese in any places other than Japan, most of them won't be able to think and write in Japanese. No doubt there might be some exceptions, but most of them won't be able to do so. Comments for How do I practise writing sentences in Japanese? I'm not entirely sure that it's a problem of understanding the mechanics of forming a sentence in Japanese. I've been studying it for a few years, and I know basic sentence structure, how particles are used, various verb conjugations, etc. The problem may be vocabulary, but I'm not entirely sure how so. I do try to learn new Japanese words quite often, and although things seem good during the actual learning (I use Memrise, and I seem to remember the words while studying there), when I go out to practice Japanese, I simply can't remember any Japanese words, or even think of anything to say at all. Again, I have no idea how to say what my problems with Japanese are, but this seems as close as I can get to it for the time being. It seems that your challenge lies in your lacking of practices. You need to do lots of practices before you can get used to forming Japanese sentences easily, without keep forgetting what you have learned. Do you have a Japanese friend or teacher? Try practise with them and they may be able to point out where your problem lie. It also seems like you have been studying Japanese online. I suggest you attend some Japanese courses where you can interact directly with a native teacher. It's kind of difficult to know your own problems if you only study it online. Unfortunately, I have had trouble implementing this advice. There are no Japanese classes in my area, and I do not have any friends who know Japanese. I have tried reaching out to people through Skype, but absolutely nobody has responded. I guess my problem is that I have no idea how to practice Japanese on any level. I try reading, but often times, there are just so many words and grammatical concepts that I have to look up that by the time I reach the end of the sentence, I have trouble putting together what the sentence is saying. I've tried learning new words and concepts through Anki, Memrise, Tae Kim, and other resources, but I think that things work too well in those contexts. While I understand things there, whenever I try to practice outside these contexts, I find that it may have been for naught. I don't know if I'm just reading at too complicated a level (I've tried searching for low level reading material) or if I'm simply approaching this incorrectly, but for whatever reason, I can never get it to work. Listening to Japanese essentially results in the same thing: I can only pick out one or two words in a sentence, and if I have a translation available, I end up relying on it instead of learning Japanese. The only practice that seems available to me is writing, and I can never find a way to write anything in Japanese without simply writing out a sentence in English, looking up every word I don't know (which will most likely be many of them), and then forming the sentence that way, which seems to defeat the purpose of learning Japanese. From what you have written, you seem to have tried learning Japanese from different websites here and there. I am not saying learning from websites is a bad idea, but your situation has led me to think that you need a proper learning ground (physical school) where someone who can interact with you face-to-face directly. That person can then evaluate your actual problem when communicating with you. He can then check why you always can't remember and apply things that you have learned. If you cannot find a school near your area, there are some online schools where you can chat with a teacher live. Try Google "learn with japanese teacher online", there should be quite a number of them. You have been learning for a few years but was getting nowhere. Instead of guessing the reasons why everything seem to be not working for you, why not go back to Basic and get yourself a teacher. I think it'll be better to start fresh again. Ultimately it still depend on how much you really want to learn this language. If you try hard enough, you'll find ways to solve the problems you're facing and get successful with the language. I think I understand you problem. My advice is to read simple text in Japanese, few times, and then to change words for other Japanese words but keeping the same structure grammar of the sentence. It makes you think in the Japanese way. It is like doing different kinds of exercises in the same text.